Hi Stampers, It is Thursday again and that means another blog hop to share with you all. Today we have a color challenge using Bermuda Bay, Crumb Cake and Old Olive. What came to mind was the “Jars of Love” Bundle from Stampin Up. Enjoy the hop and happy stamping. I used the Everyday Jars and Labels dies and the matching Jars of Love stamp set for all of the foliage and flowers in my card. Jar: Stamped in Early Espresso and cut using the matching die. The water line was Bermuda Bay stamped off 3 time to get a light color for the water. Crumb Cake was used for the stems, bow and twine. The tag was stamped in Early Espresso and cut with the Lots of Labels Framelits. The bottom of the cutout was cut to make a straight edged bottom and then inked and sponged in Early Espresso. Foliage: The background leaves were stamped in Crumb cake. I used Old Olive and matching dies for the fern and leaves. Flowers: Large flowers were inked in: 1. Crumb Cake and the centers were Early Espresso, 2. Stamped off Crumb Cake and the center was Crumb Cake, 3. Delightful Dijon stamped off and the center was full strength Delightful Dijon. The small flowers were done in Bermuda Bay inked in Bermuda Bay and one set was inked in Bermuda Bay and Early Espresso. Everything was adhered with glue to the Art piece. The final detail was little groups of pearls that added just the right amount of bling to the card. Be sure to stop by each members blog to see what they have created today and enjoy our hop. 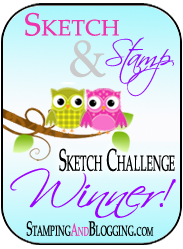 This entry was posted in Stampin Up Jars of Love, Uncategorized. Just gorgeous, Kristi! Just got this set yesterday and can’t wait to try it out, especially after seeing this beauty! You will love this set Jari, have fun. Thanks Amy, love that little tag too, it really adds to the card. Thank you Gina, I am glad you liked my card. Thank you Susan, I just love this bundle! What a beautiful bouquet !! This looks fabulous!! Thank you Jennifer, I love that we had a starting off point with the color challenge, it makes is a bit easier to decide what to do. I just love this bundle and that cute tag is adorable! Thanks for inviting me to join the blog hop! Welcome aboard. It is so much fun and helps me stay creative. Enjoy.